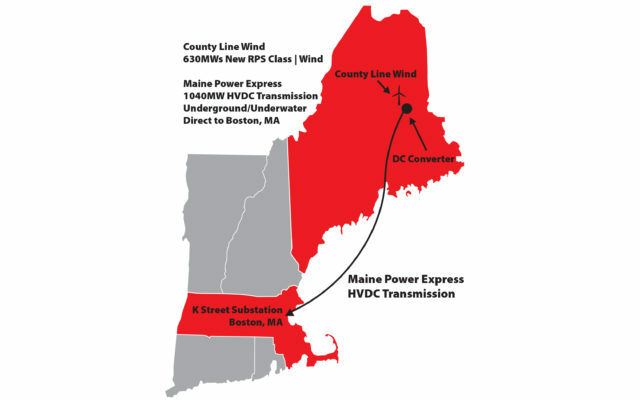 The Maine Power Express (MPX), is a proposed 1,040 MW HVDC transmission line to be buried underground along an existing energy corridor and underwater, directly to Boston, according to officials with Maine Power Express, LLC. MPX is a partnership of Maine Power Express, LLC, and Con Edison Transmission, Inc.
Amid opposition to an overhead powerline that would bring Quebec hydro electricity to Massachusetts through western Maine, a group of companies behind a wind power proposal in Aroostook County are hoping their project will become a viable alternative. Under a renewable energy procurement program by Massachusetts, Central Maine Power is seeking to build a 145-mile high-voltage transmission line carrying hydro power from Quebec through western Maine and into New England’s energy grid. The $1 billion proposed transmission line is facing significant opposition from western Maine communities and a host of environmental and outdoors groups, as did the initial proposed transmission line, the Northern Pass, that New Hampshire authorities rejected in March. The Maine proposal now needs several permits and approval from the Maine Public Utilities Commission, which is set to make a decision in March 2019. Watching and waiting for that process to play out is Hayes Gahagan, managing member of Maine Power Express, LLC, which submitted a competing proposal to supply Aroostook County wind energy for the Massachusetts clean energy program. Maine Power Express proposes bringing electricity to Massachusetts from new wind farms in Aroostook County via underground transmission lines from the southern Aroostook area to Searsport and then through underwater transmission cables from Searsport to Boston. The transmission lines would total approximately 300 miles and would cost $1 billion or more, Gahagan said. Massachusetts ultimately selected Hydro-Quebec’s proposal to supply more than 1,000 megawatts of hydro-electricity. That proposal had the Northern Pass as its first choice for transmitting the power and the western Maine transmission line as its second. If Central Maine Power’s transmission line fails to gain approval, Gahagan said that the backers of the Maine Power Express proposal want to get fresh consideration from Massachusetts, such as through a reopened procurement process. Maine Power Express is a joint venture of three companies — Loring Holdings, LLC, National Resources Energy, LLC, and Transmission Developers, LLC. The funding partner and expected owner and operator of the transmission project is Con Edison Transmission. Gahagan said that this transmission line would provide a source for proposed wind farms in Aroostook County that have had potential buyers in southern New England, but no good way to access New England’s regional grid. These proposed projects include the Number Nine Wind Farm in central Aroostook County’s unorganized territories and King Pine Wind Farm straddling southern Aroostook and northern Penobscot counties. Each proposal for those wind farms called for more than 100 turbines and a capacity of 600 megawatts. Maine Power Express envisions partnering with existing and new wind farm developers to bring a minimum of 630 megawatts of power from Aroostook to Massachusetts. That might include supplemental hydro-electricity by way of New Brunswick, Gahagan said. The transmission route would follow an existing energy corridor originally used for the Loring Air Force Base to run new underground power lines to Searsport, and then underwater lines to Boston. The underwater power lines would be similar to those used for off-shore wind farms that have been built in Europe’s North Sea, Gahagan said. “The Maine Power Express is a direct shot,” he said. If new wind farms were built, they would join Aroostook County’s two current wind farms in Mars Hill and Oakfield, and more than a dozen other wind farms operating around the state. Dylan Voorhees, climate and clean energy project director with the Natural Resources Council of Maine, said that the group has not taken a position on the Maine Power Express proposal. The NRCM is one of several groups opposed to the western Maine transmission line. Vorhees said the NRCM would want to learn more about the Maine Power Express plan, especially the details of the underwater transmission lines, but that such wind projects with underground transmission lines could provide potential economic and environmental benefits.